Here at Braxton’s we are getting ready to celebrate our 16th Annual Harvest Festival this Sunday, September 25 from 11-4. Our annual Harvest Fest is a hugely popular community event for pet lovers and animal service providers from all over the region. Harvest Fest brings together animal lovers, rescue/shelter organizations, and many other pet-related businesses and services for a day full of fun! Come by and speak with twelve local rescues , nineteen vendors from pet food companies, and other industry experts. Don’t miss Lucie from Lucie’s Barkingham Palace. She will be providing free nail clipping this year. So bring the kids, both human and furry, for a fun, family day of food, games, face painting, and more! There will be many special offers available the day of Harvest Fest designed to save you money! Click Here for a complete list! If you rent, you must provide a copy of the lease stating that you are permitted to have pets. If you are planning to adopt a dog, and presently have one or more dogs, all dogs must meet. 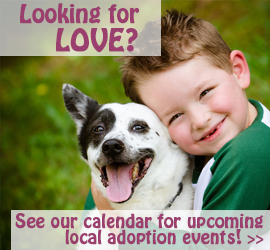 An adoption application must be completed before being considered for placement.